The recent unprecedented flooding has impacted thousands of families across Nebraska and in Southwest Iowa. To date, 74 cities and 65 counties have been declared a State of Emergency. Nebraska Athletics would like to encourage all Nebraskans to help in the relief efforts. 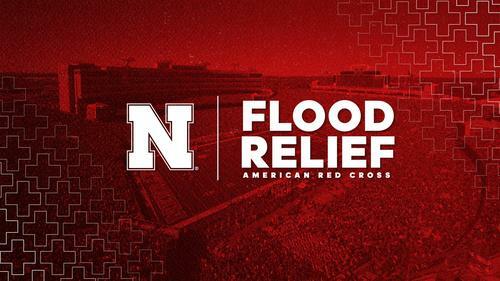 At the Nebraska Red-White football game on Saturday, April 13, 2019, the Red Cross, Nebraska Athletics, N Club letterwinners and student-athletes will collect cash donations inside all entrances of Memorial Stadium when the doors open at 11:30 a.m. until 12:50 p.m. giving Husker Fans time to get to their seats before the Tunnel Walk. Fans are asked to have their donations ready for the bucket collection upon entry in order to assist with getting fans to their seats inside the stadium. • ALL funds collected in Memorial Stadium will go toward the Nebraska / Southwest Iowa flood relief. • Volunteers will ONLY collect inside the gates and buckets will NOT be passed inside the Stadium. The Red Cross is coordinating with community and government partners to address people’s urgent needs, providing support to those affected and assisting with recovery efforts. They are focused on shelter operations, providing a safe place to stay, a place to sleep, meals and referrals to partner agencies to those who have been displaced from their homes due to the flooding.